"Casting on ... It starts almost by accident: the women who buy their knitting needles and wool from Georgia's store linger for advice, for a coffee, for a chat and before they know it, every Friday night is knitting night. Finding a pattern ... And as the needles clack, and the garments grow, the conversation moves on from patterns and yarn to life, love and everything. These women are of different ages, from different backgrounds and facing different problems, but they are drawn together by threads of affection that prove as durable as the sweaters they knit. The Friday Night Knitting Club - don't you want to join?" You know one of those books that was ok while you were reading it, kept you entertained for a while but as soon as you finished it you forgot all about the characters, one of those middle of the road books? Well this is one of them. This is yet another one of my charity shop finds, I picked it up off the shelf on a whim, thought it sounded interesting and then bought it. I figured it would be a nice little easy read, and for that it has served it's purpose well. The story is based around Georgia Walker who after finding herself left alone and pregnant by the man she loved in the middle of New York opens a small knitting shop. 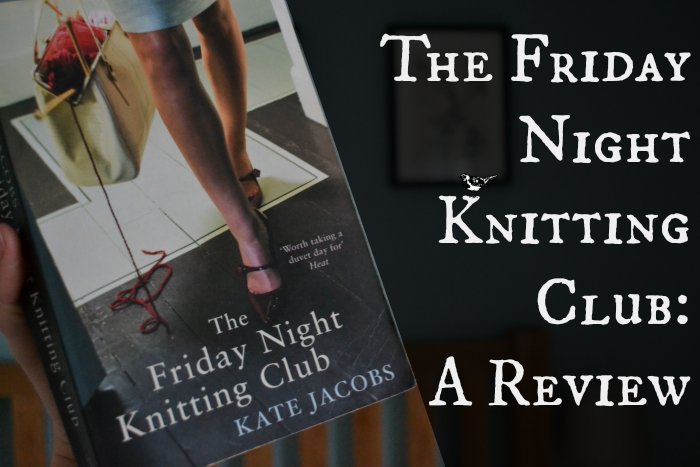 Some years down the line her daughter Dakota is now twelve and her business, although not booming, is thriving well and from a small group of women who regularly visit the shop the Friday Night Knitting Club is born. All of the characters have their own story to tell and throughout the book we get to learn about each and every one of these, although it never seems to be quite enough to grow any attachment to them. Even the main character Georgia I didn't really feel that sense of empathy for that normally you get when you read a really good book. I have to admit, although there is somewhat of a twist in this story, I was silly enough to go looking at reviews of the later books in this small series and pretty much found out what was going to happen, so I guess it didn't really have the impact that it should. I won't tell you here, it's not you conventional dramatic twist, just an unexpected turn of events if you will, which left me pretty baffled really as to why the author would choose to do this. This book is not a bad little read, but I certainly wouldn't say it will blow your socks of and I'm not exactly rushing to buy the next one. You can buy the book here, and have a look at Kate Jacobs website here. Have you read this book? What did you think? I will want to read it after reading this review it sound so interesting. great book review - very useful! I really need to get back into reading again, I bought a couple of books over summer, but I haven't quite finished them (or started a few..) yet! I seem to be a collector of 'middle of the road' books, as I find them to be a good way to just pass the time, nothing too heavy! I have been desperately trying to find some new books to read that aren't all about vampires! I will check this out on Amazon now :) I do like a book with lots of characters!